Home / Shop / Series / Terrorism, Hot Spots and Conflict-Related Issues / The Rise of ISIS: Background and Perspective from the UK and U.S. The Islamic State (IS, aka the Islamic State of Iraq and the Levant, ISIL/ISIS) is a transnational Sunni Islamist insurgent and terrorist group that has expanded its control over areas of parts of Iraq and Syria since 2013, threatening the wider region. There is debate over the degree to which the Islamic State organization might represent a direct terrorist threat to the U.S. homeland or to U.S. facilities and personnel in the region. ISIS has its roots in the Sunni rebellion against the U.S.-led occupation after the 2003 invasion. Some believe, however, that ISIS is a useful cover for former high-ranking elements of Saddam Hussein’s dismantled Sunni-dominated security forces, determined to regain their former position. ISIS has taken advantage of chaos in Syria to occupy large areas of Syrian Sunni-majority territory and set up a claimed capital there. The forces ranged against ISIS make further progress more difficult, but differing policies pursued by its opponents in the region make a coordinated response difficult. Inherent contradictions exist, particularly because of the differing strategic alignments of the respective governments of Iraq and Syria. 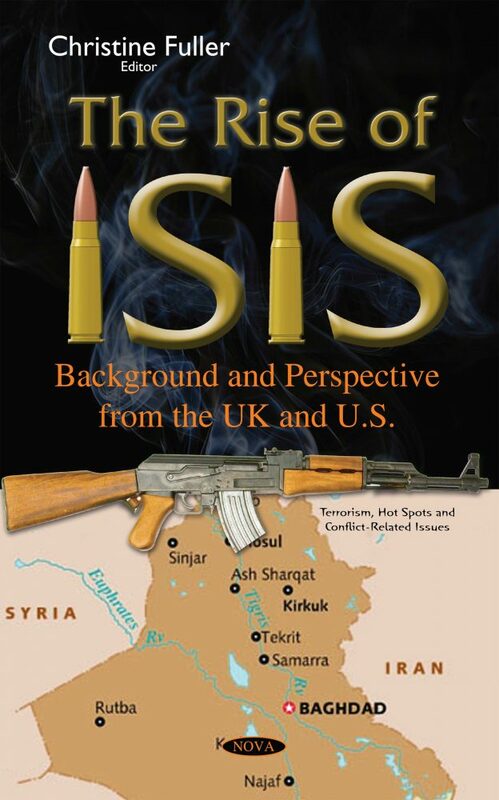 This book provides background on ISIS and its subsequent surge then examines international reaction and military action against ISIS.